I am writing to ask you to do everything in your power to help alleviate the air pollution problem in Fairbanks. Our whole family has been affected by the pollution. Our youngest child has congenital heart defects, requiring tremendously expensive open-heart surgeries to correct. We cannot take him into town when the pollution is worse than “Moderate”. He can’t go to school or church. I must stay at home with him and cannot go to work. Our income has dropped as the price of fuel has gone through the roof. We have never been in such a bad financial situation. Now, our neighbors have bought a coal burner and the smoke and smell are overwhelming. We have lived here for 35 years, and now we must make plans to leave unless something is done to stop people who are polluting other people’s property/air. The rest of the family has developed coughs, chronic bronchitis, and severe headaches when working or trying to shop in town. Yesterday, I was told of a local family who collects the clothes at the transfer site and burns them to heat their home. I checked into this, and it is apparently, sadly, true. How could this happen in the richest state in the nation, in the richest nation in the world? Another man in North Pole, whom we have witnessed, installs carpet. He takes the carpet he removes and burns it in his hydronic boiler. The chemicals coming off this burn are hideous for people’s health. He doesn’t care and has not stopped that I am aware of. We can’t go on with no enforcement. More devices burning wood and “anything that will burn” will mean more pollution, even if some of those devices have lower emissions. I am quite sure that many of the devices purchased through the Alaska Resource Agency (Rep. Tammie Wilson obtained funding for this group that she has been working with for years) have added greatly to the pollution of the area. In a sense, the state has paid to pollute us! What we need is affordable fuel oil until natural gas is IN PLACE. Dedicating more money on more and more wood/coal/whatever-burning devices is a waste of money! Burning causes the pollution. Please, we need help to have clean air to breathe and before North Pole and Fairbanks’ reputations are so tarnished that no one will want to come here, live here, or start a business here. Defiant: Has Woodriver Smoker Disobeyed Court Order to Stop? On Feb 4, 2013, Judge Robert Downes granted the state’s motion for a preliminary injunction, see CourtView case 4FA-13-01205CI. Indeed, the Straughns’ attorney has said the state’s injunction prevents the Straughns from operating the outdoor wood boilers, and they have shut them down, most likely for the season. This is according to Kim Murphy, LA Times correspondent comment on Scorched Weekend: Woodriver Polluter Smokes it Up. Then, why is their boiler still smoking Feb 5, 2013 at 11:33 am? Further, do instrumented “sniffer” vehicle maps from the Borough pinpoint the boilers’ smoke? Click on the images to enlarge. 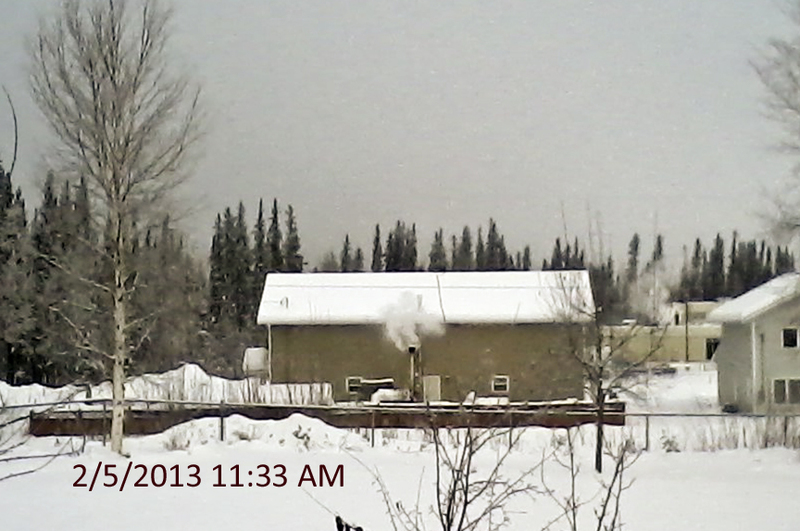 Another witness in the neighborhood reported to Clean Air Fairbanks “putrid” smoke from the Straughns’ boilers on Feb 6 and again today, Feb 12. The resident sent a complaint about the Straughns’ Feb 6 smoke that same day to Governor Sean Parnell, Commissioner Larry Hartig, Senator Click Bishop, and Representative Pete Higgins. Did the court’s Feb 4 preliminary injunction prohibit operation of the boilers? Did the injunction take effect by Feb 5 or Feb 6, or as late as today, Feb 12? If so, Andrew and Gloria Straughn may be in contempt of court. What could make these landlords defiantly disregard the health of their neighbors and a court order? Is padding the bank account with a few more bucks really worth it? Or is this an example of getting in the last licks? Only the court documents will tell. Sources tell us the Governor has taken over DEC’s enforcement authority, so all air pollution concerns need to be directed to him. 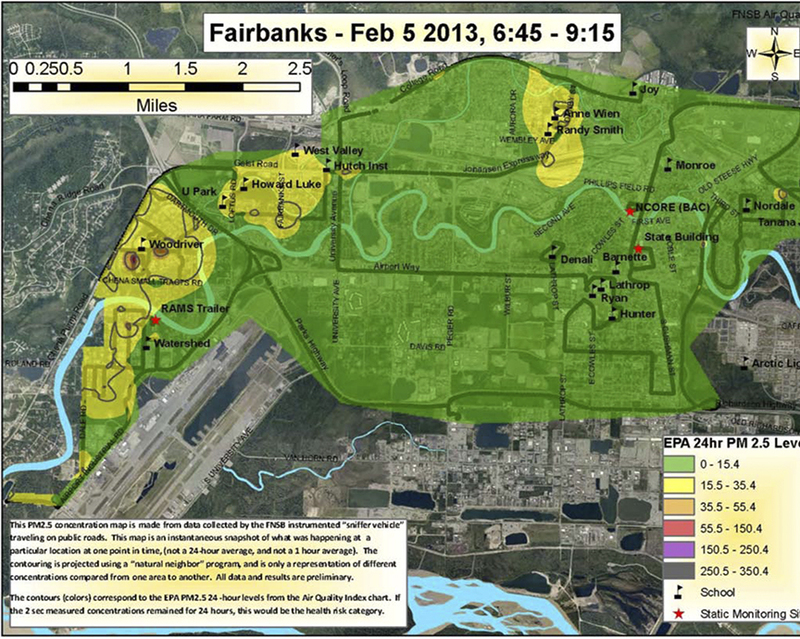 If the Governor has put a “freeze” on all air pollution enforcement in Fairbanks and North Pole, residents need to know. Please send copies of messages to the Governor, and any reply, to <cleanairfairbanks@gmail.com>. Thanks! No Veto for FNSB Stove Change-out Funding! Governor Sean Parnell did not veto any part of the $3 million in the Borough stove change-out funding included in the Capital Budget bill. Thank you loyal readers for writing and calling the Governor and your legislators to request these funds. Thank you also to the bipartisan support from every member of the Interior Delegation who carried the funding through the process, surviving challenges along the way and keeping us notified so we could enlist public support at every step. Hats off the the Borough Mayor Luke Hawkins, the Air Quality Program staff, and the Assembly who initiatied the change-out program last summer which has already served hundreds of residents. Thanks also to borough residents who responded to the need to improve air quality and removed highly polluting appliances or upgraded to more efficient and cleaner burning stoves. Clean Air Fairbanks urges the Borough administration to move quickly to assess existing applications and invite new applicants into the program. For our health and economy, we need to make maximum improvements to our air quality this coming winter. This upcoming legislative session beginning in January, we’d like to see another capital budget request for additional stove change-out funding as the need is so great. Don’t let Governor Parnell veto the $3 million in the Capital Budget for the Borough’s stove change-out program. Make no mistake, our winter smoke pollution is a pressing life and safety concern for residents of our community. Alert: Cut Smoke, Not Smoke Relief! To protect my life and safety, the FNSB stove change-out program is vital. I support budget responsibility, but protecting the life and safety of residents and visitors must be a top priority. Please don’t veto the FNSB stove change-out funding from the Capital Budget. Follow-up with an email to Governor Sean Parnell <governor@alaska.gov>. Please CC or BCC <cleanairfairbanks@gmail.com>. Thank you! $3 million for “Fairbanks North Star Borough – Wood Stove Conversion Program” is in the Capital Budget bill, House CS for CS for Senate Bill No. 46 (FIN), page 31. Senate Bill 46 has not yet been transmitted to the Governor. Track SB 46’s current status here. Once transmitted, the Governor has 20 days to veto or sign a bill. If not vetoed or signed, the bill automatically becomes law. The Governor is currently weighing his choices and may finalize some decisions as soon as the Capital Budget bill reaches his desk. Read more: Fairbanks Daily News-Miner, Parnell’s budget plans may mean $400 million in vetoes, 5/26/2011. The Borough Assembly has begun to consider changes to the stove change-out program including expanding current limitations on eligibility. Read more: Fairbanks Daily News-Miner, Commission recommends more funding for Fairbanks’ wood stove program, 5/26/2011. 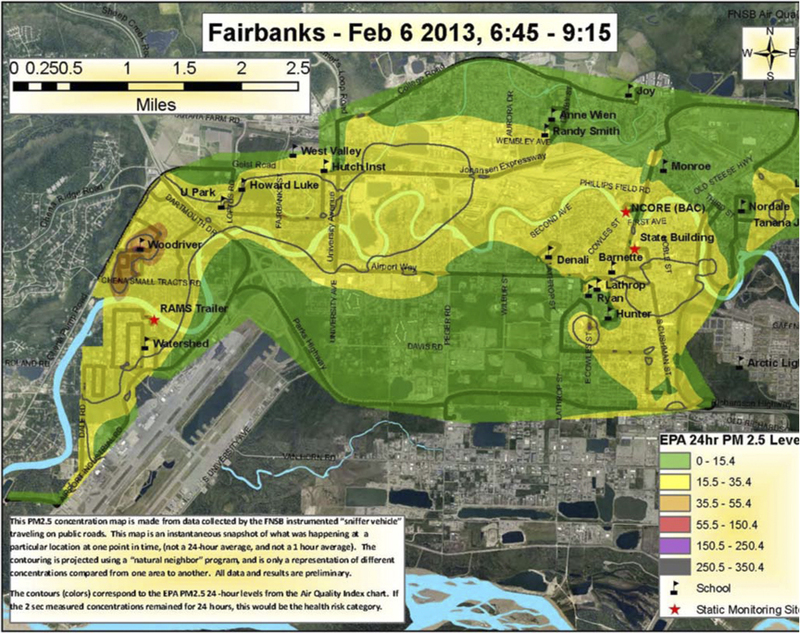 The Following letter was sent by Clean Air Fairbanks to Governor Sean Parnell. Please send your own, see post: Cut Smoke, Not Smoke Relief: Don’t Let Governor Veto Stove Change-out Funds. This is a request for your support for the Fairbanks North Star Borough stove change-out program. House CS for CS for Senate Bill No. 46 (FIN), page 31 includes $3,000,000 for “Fairbanks North Star Borough – Wood Stove Conversion Program.” This program was the headline article in the Fairbanks Daily News-Miner May 26, 2011: Commission recommends more funding for Fairbanks’ wood stove program. Protecting life and safety must be a state priority. The stove change-out program is needed to help reduce winter fine particulate (PM 2.5) air pollution which has worsened in our community since 2007. This program is running out of money. Current applications are on hold due to limited funds. The addition of $3,000,000 would allow these and new applications to be approved and the highly polluting stoves removed. Residents have documented the connection between air pollution and concerns for life and safety. Please consider the attached 230 reports of life and safety impacts from PM 2.5 pollution logged by Fairbanks North Star Borough. There can be no doubt that the high concentrations of PM 2.5 pollution in our community constitute a life and safety concern to residents. Use every available tool to reduce PM 2.5 pollution to safe levels as rapidly as possible. Please do not veto these critically needed funds. UPDATE 4/18/2011: Governor Sean Parnell called the Alaska Legislature into special session to consider a set of bills including the Capital Budget bill. Your calls to legislators are still timely. The State Senate included $3 million for the Fairbanks North Star Borough stove change-out program in the Capital Budget bill, SB 46, on April 12, 2011. In just days the Legislature adjourns for the year Sunday, April 17, but the State House and Governor Sean Parnell have not yet decided to fund the change-out program. The FNSB Assembly requested state assistance for the program, see previous post: Assembly Seeks $5M to Change-out Stoves. The FNSB PM 2.5 nonattainment area is the only area in Alaska that is failing to meet Federal Clean Air Act standards. If the State fails to submit a plan for attainment to the Environmental Protection Agency by December 2012 or fails to meet attainment by December 2014, EPA is required to step in. To pay for EPA’s role, all federal highway funds (Title 23) statewide may be redirected to pay for EPA’s costs of controlling air pollution and cleaning our air. The Federal highway appropriation is a big number (we’ve tried to find out just how big with no success), vital for road projects and Alaska’s marine highway system. Ferries are the only affordable transportation system available for many remote communities in Alaska. If our air pollution continues to be unaddressed and uncontrolled, forcing the redirection of Title 23 funding, the economy of communities statewide will be harmed. Other EPA sanctions triggered only for the nonattainment area would likely raise GVEA electric rates as PM 2.5 reductions are squeezed from power plants and other State permitted emission sources. Smoke from the burning of wood, not permitted facilities, is the primary source of the Fairbanks area winter fine particulate pollution. Review Borough data: Woodsmoke Hogs the Pie (Chart). Please phone your representative today. Follow-up with an email to your representative and CC the entire State House. [Email list of all reps at end of this post.] Ask your representative to work hard to keep in the Capital Budget at least $3 million for the FNSB stove change-out program. Tell every representative your freedom to breathe clean air depends on it . . . and so may their district’s Federal highway appropriation. Please share a copy of your message with cleanairfairbanks@gmail on your CC or BCC list. Not sure who your Representative is? View the State of Alaska’s Division of Election Maps and match the House District number where you are registered to vote with the following list.